The second solo show of Pinar Yolacan is opening Thursday November 19th at Rivington Arms. Titled "Maria," it consists of a series of photographs of Afro-Brazilian women from the island of Ithaparica in Bahia off the northeastern coast of Brazil. 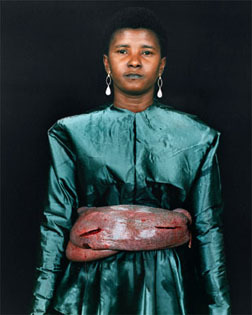 The women are photographed wearing garments made by the artist from cloth bought in local fabric stores, as well as placenta and other animal parts. Their cut and color is inspired by the Baroque era and Portuguese colonial style architecture prevalent in the nearby city of Salvador.